It is is helpful to think about your week before it happens. I noticed that Jenny likes to organise herself on Monday mornings so that after she thinks about her week, she's ready for what is ahead. I organise myself on Tuesday afternoons because I work on Monday and Tuesday so by Tuesday afternoon I have a pretty good idea what needs doing in the coming five days. At work, I have a book and write everything I need to know in it. I put the date at the top of the page and all my important things are written there. In this book I also have personal page, so that while I'm at work and also when I'm at home, if I think of anything that needs to be done the following week, it's written on this page to be dealt with when I organise myself on Tuesday afternoons. Then, about an hour before I finish work, I write a report in our work book about what happened and what needs to happen later in the week. After that report, I write up my own list for the coming week from what I've written on my personal page. As I drive home I think about that list and how I'll spend the coming five days. It doesn't take much time but it helps prepare me for what's ahead. 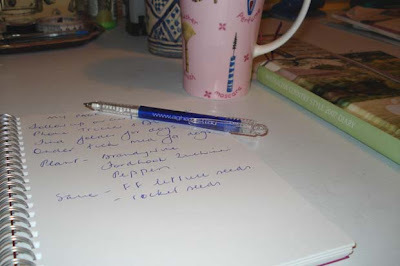 I think having a list makes it a bit easier and it often stops doubling up on things as you can plan your trips out to include everything you need, instead of making several trips for just one thing. If you work outside the home most days then this sort of organisation would be even more important. Once you have yourself organised with your list you'll have an idea of what you'll be doing each day. I get the most out of my days if I do my heavy chores in the morning when I'm fresh, and that leaves the afternoons for writing, sewing, gardening or relaxing. Don't be afraid to organise yourself however it suits you, even though others might think it's a bit odd. Simple living is all about customising your own life to suit you so that along with getting your work done, you also find as much pleasure and enjoyment as you can in your day. I'm currently changing our meal times so that we eat our main meal at lunchtime and have a sandwich or light snack in the evening. I don't care that this is uncommon in Australia, this suits us at this stage of our lives, so that's what we're doing. Thinking about how you live, getting the best from yourself, organising each day, finding pleasure in the ordinary things you do, being open to whatever your day brings, is all part of living simply. It is being mindful of how you spend your hours so they are truly lived and not lost through multitasking, boredom or being too busy to be aware of what you're doing. Try to make a conscious effort to slow down, even when you're at work. When you can, take time for yourself, even if that's just making a good cup of coffee, or sitting outside to enjoy the fresh air. Those breaks allow you recover a bit and help you remain focused for what's ahead. Do whatever you do to the best of your ability so that at the end of each day instead of being thankful you got through it, you feel pleased with what you achieved. Now I have a challenge for you. I challenge you to organise your day tomorrow, no matter what you are doing, to be as productive and pleasurable as you can make it. I wish you the best and hope you enjoy your day. If you have time, let me know what you did. You can either leave a comment or send and email to rhondahetzel @ gmail . com - take out the spaces in that address. This is my plan for today. We have storm force winds and rain forecast today so I'm going to reorganise my undercover clothes line. It's a bit too high for me at the moment, so I'll ask H to help me lower it. I want to make it a permanent feature on the back verandah where I have plenty of room to hang clothes when it's raining, so I never have to use the dryer. I'm going to tidy up out there as I go and make the area as work friendly and inviting as I can. Make bread and a cake. Do several loads of washing. I might do two today and two tomorrow. Rearrange my pot plants and move some to my washing line area. Wash up and tidy the kitchen - pick some flowers for my window sill. After lunch, I'll be writing. I have found I work best with a To Do List. When I make a list I founf myself rushing through the day just to get things done. So now in order to keep my life simple. I just make notes of important things. The day to day things I just do. I have my days sit up so I so the same task on that day each week. I have bananas on my trees in my back yard. I posted a picture this week. They will be ripe next April. I love reading your post on simple living. BTW, when the day is done or the to do list has everything crossed off it, I tear it into tiny pieces and feed it to my worms. There is something very satifying in that odd little secret ritual! That was Wildside up there, BTW!!! Hello Elizabeth. It's great how a little list can give you some order to your dfay. I must check out your banana photo. I am glad to hear that you had a nice journey and I'm happy to see you back. I appreciate your gentle guidance. I too, write a to do list. Otherwise I would never get anything done! After years of writing on old envelopes etc, I followed Jewel's(Eyes of Wonder) beautiful idea for a daily journal and bought myself a visual art diary and decorated the pages throughout and it gives me such pleasure every time I open it. It has transformed my 'chore' list into a thing of beauty. Also, I put any recipes I come across in there as well, so I can always just flick back through the pages to find what I am after. I used to write daily lists but got upset when I never completed the list so I at the moment I don't write anything down. I always have lists but like Ali,often feel like I've failed because I haven't finished everything on my list. Maybe I have a touch of Wildside's problem, misunderstanding the number of hours in a day. However I do make one list which is of all things I need to do or buy on my once a week visit to our local shopping centre and another list of things I need to do if we visit our son who lives near a Spotlight store and a shop where I buy some food items I can't get locally. This morning I picked up K's drycleaning, bought some fruit & vegies at a new green grocer who tries to source his produce locally, had a prescription filled at the chemist's and made a dash into the supermarket for sugar. Normally I would get that at Aldi but I've been making marmalade and I've used more than I usually would before my next Aldi shop. This afternoon I'm preparing some onions for pickling, finally sewing up my son's jumper and then I'm going to cut a fresh bunch of wattle for the dining table to bring some sunshine indoors. I have alot of problems with this at the moment because I work shift work. My shifts change every week and it is very hard to plan anything more than a few days in advance. I always seem to end up trying to cram everything into one day a week. For example I start work at 9.30pm tonight but have no idea what time I will finish. It could be anywhere between 1.30am to 6am so I don't even know when I will get out of bed next day! I have been doing this for 9 months now and still haven't been able to get some sort of routine worked out. I do have a 'no washing on a Sunday' rule but that's about it. I always seem to keep up with just about everything but feel that I could do so much more if I were more organized. I never feel like I am getting the most out of the day and this is something I would really like to change. shell, what a nice idea to have a daily journal. I've seen Jewel's journal and it's a real beauty. I imagine such a book would motivate you too. I have a household journal that might be fairly similar, it makes it easy keeping my recipes, downloads, seed catalogues, green recipes etc together. I have to also add that it's wonderful to find beauty in the ordinary things of your every day world. HI Polly! I always see you as a super organised homemaker so it's no surprise to me that you modified the way you get around your chores. It sounds like a very productive day you have planned, my jam making days are approaching too, it's a time of year I love. I'm pleased to read you brought in some wattle, I bet it looks lovely on your table. michelle, is your shift work a long term thing? If it isn't maybe you could keep going as you are until it's over. If it is, don't stress over lists, there will be a way around it. It would be very difficult not knowing when you'll finish work, and therefore how long you'll sleep the next day. My intuition tells me you'll do better with a weekly list, something like Wildside's - categorise your days, instead of listing chores. And above all else, don't worry if something is not done, there is always tomorrow. I found with lists that I couldn't avoid the temptation to keep adding to the bottom of the list and so my list never really got any shorter. Some days I do still use a list and find it helpful but I also use the "theme" idea for each day (I think I got the idea from flylady). Some things like washing get done daily but I find the routine of knowing what's happening each day helps to keep me on track. I really like my job which is just as well because I think I will be there for another 10 years! I almost never work on a Sunday so I think I will use that day to try and plan my week. I get my roster on a Wednesday so this will give me a few days to mull over what I can fit in on which day and then I will make a plan in my diary. I'm sure I can do better than I am now. I get easily distracted so I really need a plan. I also need to NOT turn the TV on while I'm eating lunch because I am a TV addict!!!! I use a dayplanner. That may seem silly for a SAH mom, but it really keeps everything organized for me. Our household routine is very routine. We know which room gets extra cleaning on each day. I do keep a running list of replacements that need to be purchased. How I love this post, and love reading everyone's methods for "getting it done.' One thing I have added to my daily routine, just recently is reading your blog. I find it always motivates and inspires to get things done and to endeavor to enjoy the simple things. So far that has been most effective. I really like the idea of a journal and have some journals "stockpiled" so that will help with the issue of losing bits of paper. I do make up a list of absolute things that must get done for the week, like order medications and sending out gifts by mail. And that helps me keep on track. In the summer, I have a dear friend who lives a great distance, and in addition to keeping in touch, we use our emails to set weekly personal and household goals and then report daily on our progress. This has helped us keep in touch and really stay connected. But then in late summer she goes back to teaching school, so we do a more manageable weekly email.